Hinds County rancher and farmer Cindy Ayers is sold on high tunnels. The one-time New York City investment banker is counting on the greenhouse-like structures to keep her new operation in the black. Ayers established her 99-acre Foot Print Farms near Jackson in March 2011. The following December she installed a 2,100-square-foot high tunnel. High tunnels, sometimes called hoop houses, are arch-shaped structures consisting of a plastic or metal frame covered by greenhouse-grade polyethylene. They can be as small as 20 feet by 30 feet, or large enough to cover a half-acre. High tunnels trap solar heat inside the structure during daylight hours. Farmers can regulate internal temperatures by opening or closing side and end panels. The process is ecofriendly and disregards the use of fossil fuels. “It gives you a longer growing period,” Ayers says. “You can almost have four seasons of crops. I take one month out to allow the soil to rejuvenate.” Built adjacent to a tennis court where raised beds have replaced nets and rackets, Ayers jokingly calls her high tunnel the Serena Williams Tennis Garden. It may be experimental, but it’s no joke. “This is a major project,” she says. “It’s not a hobby.” Within the freestanding structure, Ayers raises broccoli, squash, peppers, zucchini, tomatoes, herbs and other produce. She sells to restaurants, farmers markets and on-site direct to consumers. How High Tunnels Work The high tunnel supports Ayers’ natural farming methods by creating an environment in which vital nutrients are kept in the soil, runoff is curtailed and pest issues decreased. Protected from rain, foliage is safe from excess moisture often resulting in disease. In typical high tunnel practices, weeds are minimized through the use of plastic mulch and drip irrigation. Results are better quality products, higher yields and greater grower profits. High tunnels provide growers with the competitive advantage of marketing products in the shoulder seasons when others can’t. Ayers purchased her structure with help from a U. S. Department of Agriculture and Natural Resources Conservation Service cost-sharing program. The program picked up 90 percent of the $9,000 cost. For the past five years, Bill Evans and Guihong Bi have researched high tunnels from their base at the Truck Crops Branch experiment station at the Central Mississippi Research and Extension Center near Crystal Springs. They’ve introduced state growers to the benefits of the structures for raising cut flowers and vegetables. “In Mississippi, we’ve gone from seeing five or six high tunnels a few years ago to over 300,” Evans says. “And growth has not slowed.” The structures are most practical for the small to medium-sized grower, according to Bi. Bi’s focus is cut flowers. 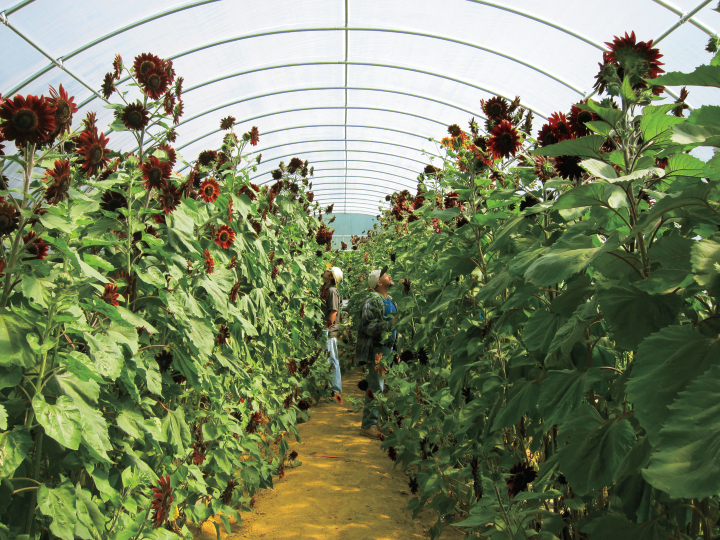 She finds high tunnels allow producers to grow flowers, like zinnias, sunflowers and snapdragons, at a higher density and protect the plants from wind and storm damage. “They are better quality and have a better yield when compared to field products,” she says. While high tunnels have proven beneficial, the producer’s degree of success ultimately depends on the type of crop and crop management practices, Bi adds.